The Green Girl was thrilled to receive her first ever advance reader's edition when she was offered a copy of Sarah Marquis' Wild by Nature: From Siberia to Australia, Three Years Alone in the Wilderness on Foot. 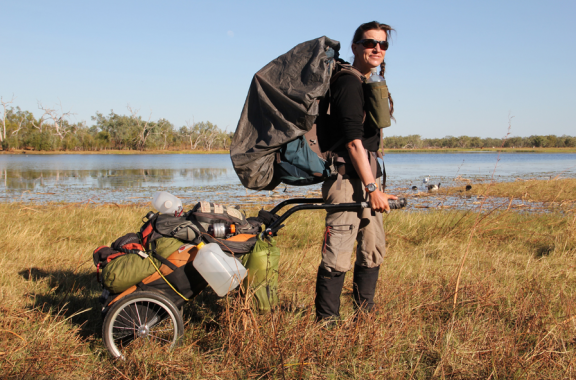 Wild by Nature follows Swiss National Geographic Explorer Sarah Marquis on the trail of her 10,000 mile 'eXplorAsia' solo hike across the remote Gobi desert from Siberia to Thailand. 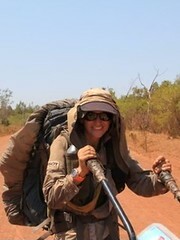 From Thailand, she travels by boat and completes her hike in Northern Australia. The author is Swiss and it's my understanding that the book was translated from French to English. I believe some of the meaning may have been lost or skewed in translation. I also acknowledge the fact that cultural heuristics mold and influence world attitudes and views. I found her writing incongruous, disjointed, and detached. I felt she had a lack of respect for the native inhabitants of the lands she encroached on but an intense appreciation for Mother Nature. I was often left yearning for more details. But I was still blown away by the magnitude of her solo journey. Preparing for a 3 year hike is a significant undertaking and I would have appreciated more details regarding her training and preparation. I also wish she would have provided the gear list that comprised her 75 lb backpack and 120 lb cart. I appreciated insights like tips on how to collect water in an arid region. I also learned a lot from how she handled herself in the difficult and potentially volatile encounters. She even resorted to sleeping in sewage pipes - sometimes alongside animal carcasses - to avoid night visits from drunk Mongolian men. 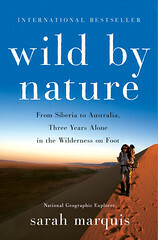 Wild by Nature goes on sale today, February 9th. If you would like your very own copy of Wild by Nature, The Running Green Girl is pairing up with St. Martin's Press for a giveaway. a Rafflecopter giveaway Giveaway ends Friday, February 19th at 12:00 midnight Pacific Time. If you encounter any issues entering this giveaway via Rafflecopter, please let me know. Yeay! Can't wait to see you tomorrow! Hi! I loved WILD and before reading WILD, I loved reading A Walk in the Woods. A Walk in the Woods was also made into a movie with Robert Redford and Nick Nolte. It is hilarious (the book was funnier) but I wished it had gotten better exposure. MY dream (retirement years, maybe) is to do either the AP or the PCT. One of these years soon I'll be walking the John Muir Trail with my kiddo. This is so up my alley and I'm intrigued by your comment on her attitude towards the natives. I hope there's a ebook version available. REALLY????? THAT'S AWESOME THANK YOU!!!!! I am so excited about this giveaway and definitely interested in her journey!